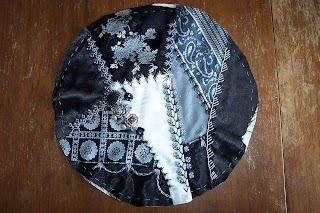 Crazy quilting and anything else that might cross my fertile mind. Hi! I'm Janet, I'm happily married,a mother of 3 daughters, and grandmother of 2 grandsons. I love crazy quilts, old and new. I've lived here in River City/Happy Valley all my life. I think it's the one of the prettiest places on earth. What a beautiful center for this wheel! I love the feathers from the bottom center on up---are those beads? I am encouraged to move on to other colors even if the whole group is not ready! hehehehe you are such an inspiration! Wow Janet I was wondering what you were going to do in the center,,,this is beautiful.